These images of creation—sometimes sprawling and sometimes silent—are born of photographer P.J. Oswald's journeys around his native Northern California and the rest of the world. You could say these images are fueled by his wanderlust and wonder. Each certainly bears a story. P.J. invites you to make his works of art a part of your collection, and part of your story. 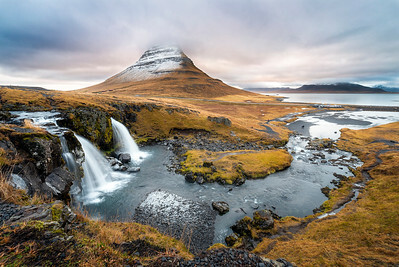 Prints, canvases, and framed artworks of the finest quality are available for purchase for each landscape you see here. 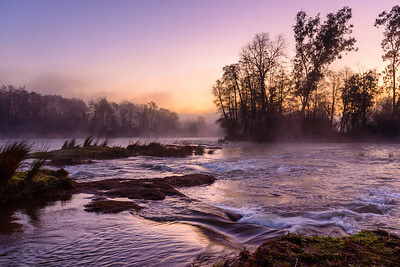 An early morning image of American River captured near Sacramento, California. 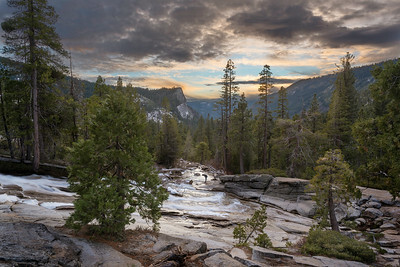 The morning mist flowed along just as quickly as its rain-swollen waters. Captured just a few days after Christmas. You'd be forgiven for thinking this was another stretch of the Grand Canyon. 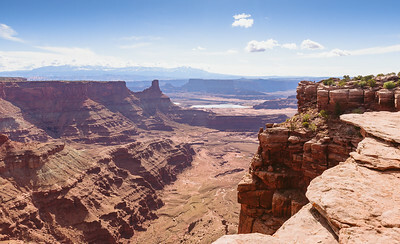 This overlook is brought to you by of one of the many canyons near Dead Horse Point State Park near Moab, Utah. Perhaps the hikers at the right can give an indication of just how expansive and deep this canyon is. An early morning photo walk brought me upon this tree, set apart from the others planted along the American River trail. While the morning mist was grey to my eye, taking a long-exposure by camera brought out all the beautiful color that my own eyes couldn't take in. While I was enjoying this vista over the landscape at Strawberry, this fella looked like he saw something incredible in the water. Wish I knew what it was! Just a few hundred yards back down the beach were hundreds of people from around the world, taking in the alien sight of a handful of icebergs washed ashore. Though as my wife and I walked further from the noise, and far from footprint-marred sand, we discovered a part of the beach with no one around. Even better, new chunks of ice were arriving like clockwork. 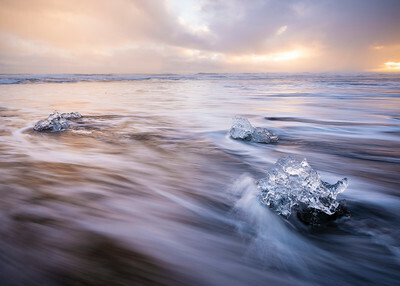 With each wave that pounded the shore, some ice was taken and some was deposited. And thanks to a bit of sun, the name "Diamond Beach" made that much more sense. You expect sun, surf, and shave ice when you visit Hawaii's Big Island, and yet sun was in short supply that day. That didn't stop me from visiting one of its beaches, covered over by the rocky remnants of an ancient lava flow. 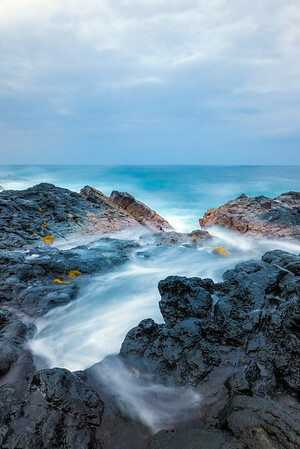 In this long exposure of the waves breaking over the beach, you can almost imagine the steamy, original collision of fire and water. You can also imagine me slipping and falling a few times in the making of this image. The sea haze began to roll in at the same time as the sun began to set there at Point Reyes National Seashore in Northern California. As we drove home from a great day out at the beach, we spotted this: a tunnel of Cypress trees leading toward the KPH Maritime Radio Receiving Station. Talk about your grand entrance! It is as if the trees had a will of their own--offering shelter to those who travel below. With just two days of Hawaiian travels remaining, I had yet to capture a sunset. Overcast evenings and packed schedules meant that timing just hadn't worked out. 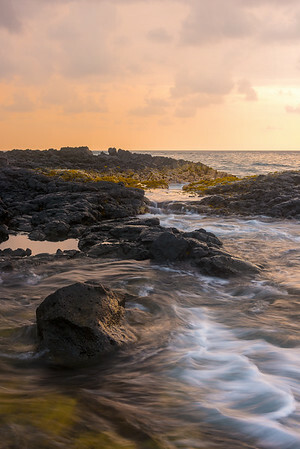 And though it was raining and I was wet from snorkeling (and had just ordered a cheeseburger) I darted with my gear over to the shoreline at Kailua-Kona to see what might present itself while the sun set. I'm so glad I did, despite the cold burger waiting for me when I got back to the table. While driving across the south coast of Iceland, we spotted groups of multicolored, shaggy horses dotting the countryside. They huddled together in the chill wind, grazing, and standing in defiance of the harsh elements. When I crept in closer for a look at this solitary fellow, he greeted me with this face. 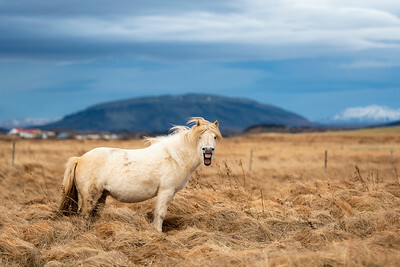 I'm told that horses make this look when they are yawning, or trying their hardest to catch a whiff of something. All I can think is that he was yelling at me to get off his property. 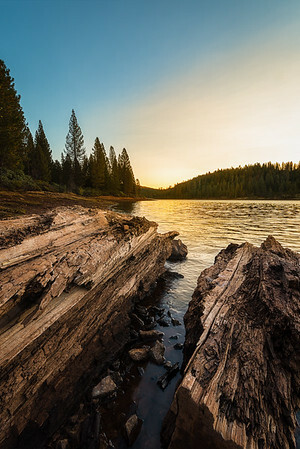 An early morning view from the shoreline of Northern California's Bass Lake between early morning rain storms. A relatively warm winter combined with drought conditions and some parasitic beetles colored many of the evergreens with a stunning suit of red. Courtesy of one wet camera. It was a boys' biking weekend of riding our fool legs off, and I knew I would have trouble sleeping. 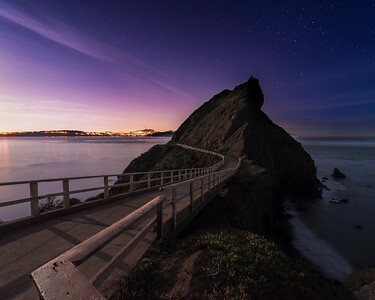 So after dropping the boys at the hostel, I took the truck out to Point Bonita in hopes of photographing it's old lighthouse. Fat chance. As my sore legs crossed the bridge you see here, I discovered a tunnel with a locked door--keeping me from getting any closer to the lighthouse. So I started back across the bridge to head for the car, when I turned and realized that this sight was as good as any I would have seen. I planted my tripod in the ground and got to work. Scotland's Loch Ness stretches on for over twenty miles, surrounded on both sides by beautiful low-lying hills. This was the morning view we took in riding a boat along the waters of Loch Ness. 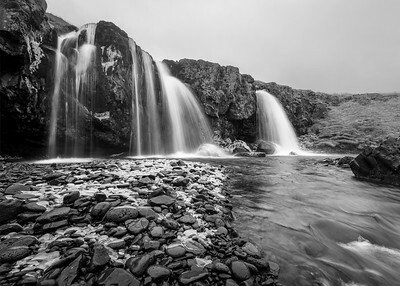 So many of Iceland's iconic waterfalls take less work than you'd think to reach. The Ring Road highway that winds around the island often leaves you with just a few hundred feet to walk from your car to take in the majestic sites. The real challenge begins with photographing the falls. All sorts of chilly spray blasts not only your face, but the lens of your camera--covering it with water that threatens to blur your image. I was fighting that very blur with a near-soaking cloth while kneeling near this pile of pumice and ice in front of Kirkjufellfoss. And I was loving every minute of it. 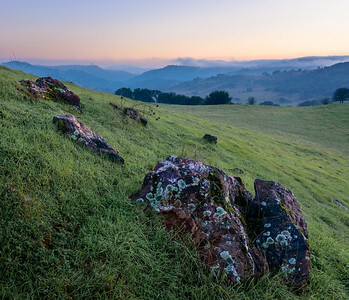 This view came from a hillside at Cronan Ranch Trails one winter in California. The plans had begun flat, but began climbing upward to form the foothills of the Sierra Nevada mountains. While hikers and parasailers had packed the park earlier, most had left by this time, leaving expansive spaces open for us to explore. This string of rocks seemed ancient, but supported all sorts of mossy, planty things that seemed to be thriving here. A beautiful recollection of a pristine space at a wonderful time of day. 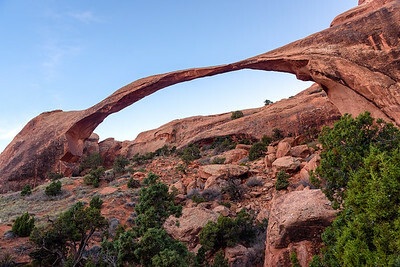 A ground-level view of the sandstone Landscape Arch in Arches National Park near Moab, Utah. This image that followed a breathless run to race the sun and reach the scene before the sun went down. Next time, remind me to start out a bit earlier. Scotland is a country of green and gray: lush, well-watered hillsides and gray cloud cover. And all that green just wouldn't be without all that gray. 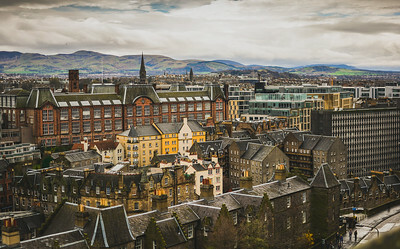 This image captures the second city of Scotland, Edinburgh. This view of a city both modern, aged, and altogether charming was taken from the parapets of Edinburgh Castle. 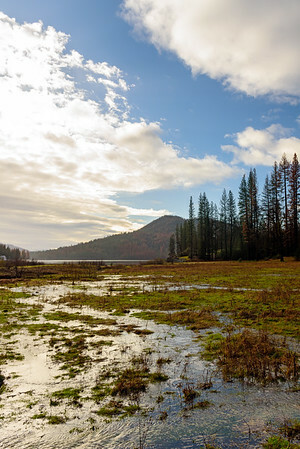 The view while walking the waterlogged shores of Northern California's Bass Lake. A weekend storm dropped sheets of rain on a lake bottom that had been exposed to the sun by three years of drought. This is what it looks like to refill a lake. 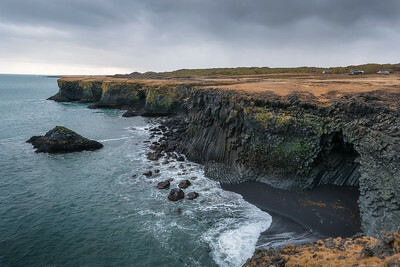 Gusts and gales whipped us as we walked the path from Arnarstapi to Hellnar, sometimes blowing in our faces and sometimes pushing at our backs. It was difficult to tell if the weather wanted us to move along or just throw us over the edge into the Atlantic Ocean. The cave you see cut into the basalt column formations made it all feel even more menacing, as though a dragon was likely to emerge at any moment. During a visit to Calico (a silver-mining-town-turned-ghost-town) I glanced off to my right to see a set of hikers just beginning their journey for the evening. The sunset lent their first steps a dramatic feel, and a vivid memory of my own explorations of the area. An aged Oak tree sits bereft of leaves in the low winter sun, with branches that have begun to lean low to the ground with age. The gnarled branches give a haunting impression, as though they had to twist and turn unnaturally to grow at all. 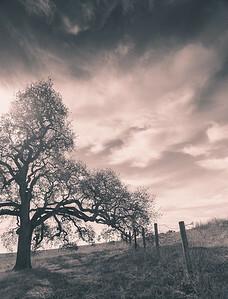 The image was captured near Napa, California on an unseasonably warm day in November. 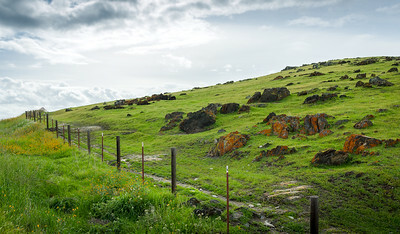 A Northern California hillside is made green once again by the heavy rainclouds overhead. The grasses are dotted by oxidized rock that hints at the geology of the nearby Sierra Nevada mountain range. I wasn't thinking about the science when I shot this--just the delight of seeing green return to a drought-ridden countryside. This was not one of my introverted, landscape-chewing photography sessions. This was a holiday hike with the entire family and some friends along the Confluence Trail just outside Auburn, CA. While the kids couldn't quite handle covering the whole distance, their slowing pace allowed me a few minutes to perch my tripod in the river for some shots of the beautiful hues of the rock peeking out from the water. I loved the entire time hiking with this crew, but this little moment by the river was soul food to me. 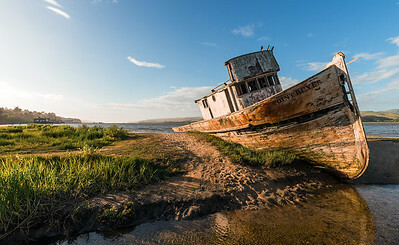 Only after returning home from my first trip to Northern California's Point Reyes National Seashore did I learn just how many iconic spots it features. So on my second visit, I knew I'd need to spend some time with this unlucky lady. Though "some time" turned into about five minutes as my camera battery died shortly after arriving. My kids showed their relief at the empty battery by splashing in the little streams diving the shipwreck from the shore. A busy day's travels had led me to Portland, OR. Yet the minute I finished up at the office, I drove like a bat out of...uh, Portland... to the Columbia River Gorge for a hike. It was only as I wrapped up my adventure and started the drive back to town that gasped at the hazy, orange skies that gave the gorge an entirely different coat of paint. I stopped of near the Bridal Veil Falls State Park to see if there was a view worth capturing. Just as I set up my tripod, my wife and kids gave me a Skype call to check in. While normally I might have avoided the call to get some introvert-time, I was glad for it on this particular evening. Talking to my kids about nothing in particular while taking in the view was a salve to a sleepy soul. 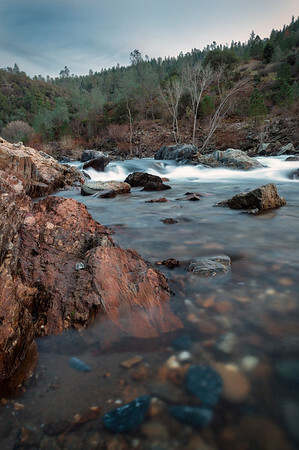 Water and light washed down the rocky banks of the South Yuba River on a cold winter morning. 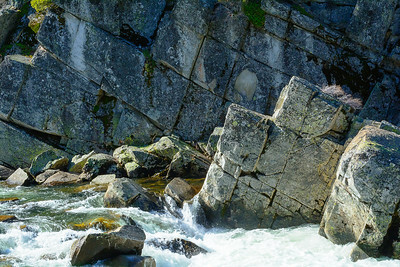 The geology of this river corridor made it look as though God had systematically sliced up the rock walls into segments to serve to some rock golems. I didn't see golems, but saw evidence of God everywhere. Redwoods. They make me think of childhood camping, vivid colors, Ewoks, and banana slugs. 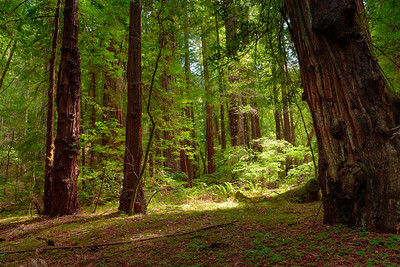 I love to discover places on earth that are tall enough and powerful enough to block out the sun, and the Armstrong Redwoods in Northern California is one such grove. Only at this spot, a bit more light than usual broke on through at this spot. 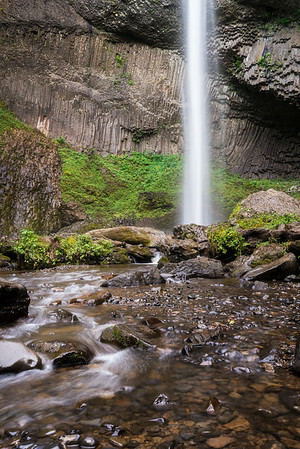 My day started with a missed flight, centered around some marketing work, and ended in the mists of Latourell Falls. 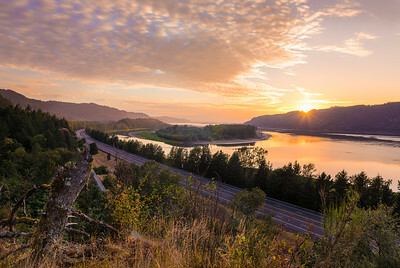 It didn't matter that my eyelids were as heavy as bowling balls, I knew that I needed to get out of town to the Columbia River Gorge for an evening hike. And while I had planned to hike for a couple hours I reached these falls after just five minutes of walking. And there I stayed with my camera until the sun sank low. Sometimes a little hard work pays off. My wife wondered why I packed long pants, thermal underwear, and a hoodie sweatshirt for our trip to Hawaii. I had planned for months to make it up the towering slopes of Maunakea, and this was my night. Only 10 minutes before this shot was taken, the clouds had closed in around me and I could see nothing. But when they opened up and the sun had just set, it was my time to capture this panorama of the remaining clouds colliding with old cinder cones on the way up this dormant volcano. You don't expect chilly temperatures in Hawaii, but that's what you get at 10,000 feet. An early summer onslaught had cooped my kids up in the house all day. And so when the Delta Breeze began to blow and cool Sacramento down, the whole family went out for a walk by the American River. There was much throwing of rocks, rolling in sand, and harassing of ducks. 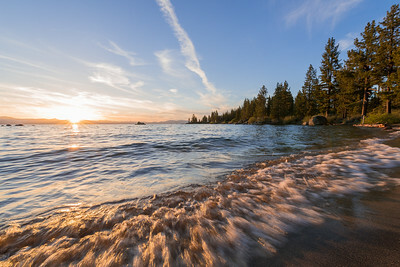 Though when the sun finally set, all felt quiet and calm in the world...at least in front of the lens!